There is a good deal of discussion these days about client/case conversion but what attorneys often fail to realize is something that the insurance companies learned a long time ago: most people buy from the first responder. Geico, who has literally spent billions of dollars on their brand name alone, found in their own studies that most people will only get one insurance quote and then buy from that firm. When it comes to attorneys, people’s buying habits are no different. In FindLaw’s recently released 2014 consumer legal needs survey they found that fully 72% of respondents indicated that they only contacted one attorney before selecting them. The remaining 15% contacted two attorneys and 13% three attorneys. In short, nearly ¾ of consumers do not continue to shop around after initially contacting an attorney. SO WHAT CAN ATTORNEYS LEARN FROM THIS? We know from previous studies that people will on average look at 4.8 attorney websites before they contact a firm – so they ARE shopping around. The issue here is that the shopping process for attorneys ends 72% of the time after the initial contact is made. Online consumer opinions were the backbone to building such websites as Amazon.com, ebay, Yelp and others. Why? Because 79% of consumers now indicate that they trust online opinions about you. This is important for attorneys because many page-one search results for attorneys and/or law firms include consumer opinion sites like Yelp, AVVO, Google local and others. So have you created a strategy to manage your brand reputation online? Remember: if you do not proactively define your brand, others will define it for you. Since most referrals are given out in numbers, write down the names of your top 3-5 referrals competitors. Next, Google their names and firm names and look at the results – compare them to yours. Finally, look at their websites and also compare them to yours. If you were an objective consumer who has never used an attorney before, which search results impress you the most? If it is not you, you have work to do here. Is your online presence an accurate reflection of what you want people to think of your firm (your brand)? As the old saying goes, you never get a second chance to make a good first impression. Most attorneys today already have a website so the question is moving beyond “IF” you need a website to now “HOW” you need a website. Most of your new and referral clients are looking at your website and formulating an opinion about you BEFORE they ever contact you. They are also increasing looking beyond your website alone to look for more information about you from other resources. In a growing number of instances, we are seeing these “delayed conversions” in excess of 60% of the time. 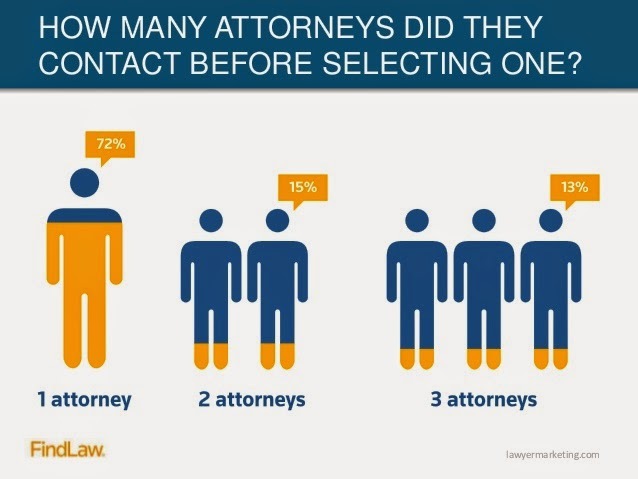 We know from the same FindLaw survey that 74% of contacts attorneys receive are by phone while only 7% are by email and 2% by online contact form. We also know from other surveys that 80% of callers will hang-up when they get a voicemail. I am still amazed at how many times I will call a law firm on hours and off hours and receive a voicemail or no answer within 5-7 rings. If a caller receives and voicemail and/or if they hear 5-7 rings or more, you are sending them a message (intentional or not) that your contact is not of high importance to them. If you do not have a live body answering the phone quickly 24/7 you are losing client and cases – period! 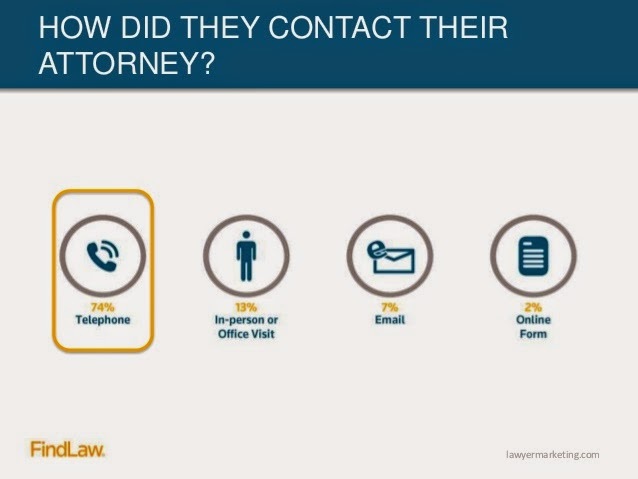 In summary, people shop around for attorneys but 72% of the shopping stops at the first attorney they contact. Since the majority of the decisions the consumers and referrals make about you comes from their research online BEFORE they contact you, you need to be smart, proactive and competitive in your evaluations of how you can become the first attorney they chose to contact. You also need to make sure that they way the majority of them prefer to contact you (PHONE) leads to a conversion and not a hang-up. When you're looking for outsized window treatments or possibly slick model spectacles, you may see established replica rolex spectacles men of all ages which usually caters to any standards. Beyond Prada sunglass just for men of all ages there are also prada spectacles for ladies. The style listed replica rolex datejust was first arose in Italia and additionally Mario Prada engineered the software. More often than not, Prada gentlemen athletic shoes include a competitive price-range about $99 to make sure you $949 and additionally in this article. So you aquire plenty opportunity to find the Prada athletic shoes on your daydream consistent with you will budget allowed. A lot of fashions want specialized, locale, dior replica bags, garden, unconventional accessories are likewise obtainable. Pick the right supplement and additionally appeal your income. Gentlemen athletic shoes are around every corner and additionally produced with imitation leather, suede imitation leather, fake chanel, laced drawing a line under combined with rubberized. Different dior replica is as well attainable want schokohäutige, along with white, dark brown, beige accessories. A fabulous elegant airborne dust back pack and therefore the make certain account are likewise delivered around the system about Prada athletic shoes.